It is that time of year again! The Geek Tribes are assembling to celebrate Cosplay, Toys, Comic Books, Video Games, Superhero Flix, Pop! Culture and the never ending hunt for those Elusive Exclusives!!! The PowerCore crew are headed to sunny San Diego once more for the mother of all conventions – San Diego Comic-con! It’s hard to believe that it’s only been a year since PowerCore rolled out the very first version of our COLLECTOR app – unlocking Digital Messaging Stickers with PowerCore Codes on Vinyl stickers. We have spent the last year heading to cons around the world developing new and exciting applications for PowerCore codes. 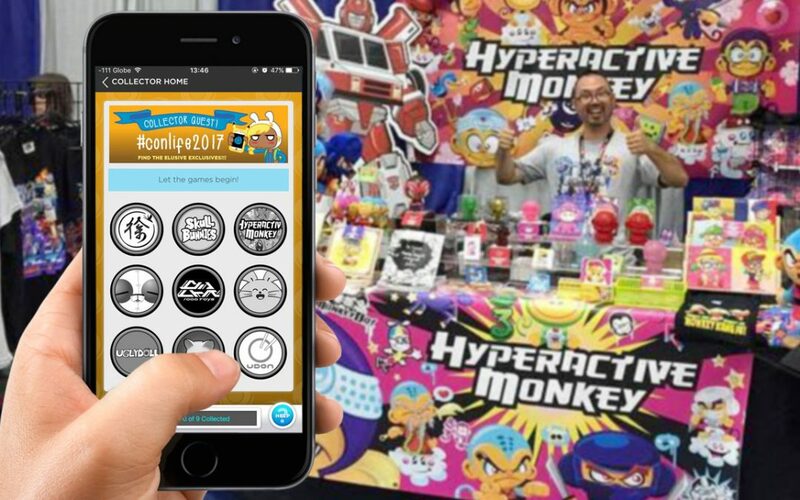 At San Diego Comic-con 2017, PowerCore Activation technologies will be in effect at several locations around the convention. PowerCore Collector Quests have proven to be a big hit at DesignerCon and ToyCon UK. At SDCC we are rolling out another one – #conlife2017: the Hunt for the Elusive Exclusives! To participate in the Collector Quest simply download the free COLLECTOR Smartphone app – available for both android and iOS. Inside the app will be a list of participating booths and the exclusives they have on offer. Find the booth – scan the code from the activation station – collect all the medallions – then come back to booth #5640 to receive your limited edition SDCC2017 enamel art pin plus a chance to win exclusive prizes from the participating artists in the Bonus Raffle. For the full scoop on the Collector Quest check out the official page here. PowerCore has been working closely with gamemaker nWay to integrate the PowerCore Activation Platform into their popular Power Rangers: Legacy Wars real-time action fighting game. Six exclusive Power Ranger Hex Cards with special codes to unlock In-game rewards will be available at the Lionsgate booth (Booth #4045). Download Power Rangers Legacy Wars now! PowerCore will also have an exclusive selection of soft vinyl toys from Japanese Toy Makers at our Booth #5460 (w/ Hyperactive Monkey) including Inu-Harigon by Teresa Chiba, Sakana-Tori by Hikari Bambi and Pogola by Kaiju Dan. PowerCore will also have a healthy selection of art pins and other fun merch available. Watch the PowerCore Instagram for more info on releases and colorways. PowerCore is helping to produce Dragon Boy Super! – a new vinyl version of Dragon Boy and Dog dropping later this year. The good news is that you will be able to pre-order the figure at SDCC and receive a pre-order limited edition print (while supplies last). Last year PowerCore also teamed up with Martin Hsu to produce the Kindred – a beautiful resin creation by Martin. This year will see the debut of the Kindreds Figure Artists series – a selection of beautiful customs including works by Maxtoy’s Mark Nagata, Nicole Gustafsson, Emma SanCartier, Jeremiah Ketner and Kozyndan. Check out Martin Hsu’s Facebook and Instagram for the latest info and sneak peeks. Whew! Hope to see you all at the Con!